Emminent Shayar and recepient of Padma Shri Dr. Kalim Ahmed Ajiz away on saturday. He was 95 years old. Currently he was Chairman,Urdu advisory committee,Government of Bihar. The author of several books on poetry Dr. Ajiz was a retired professor of Patna University. 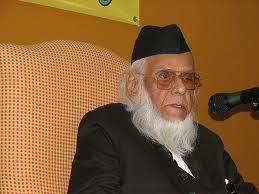 Dr Ajiz was born in Patna in 1920. He was a gold medalist in BA from Patna College and then earned his Masters degree in Urdu from Patna University. He also got his doctorate from Patna University for his thesis on “Evolution of Urdu Literature in Bihar.” Dr. Ajiz avoids any sort of publicity or fanfare despite the fact that he has hundred of thousands of admirers all over the world. For the last 10-15 years, he avoided mushairas as he believes their quality has gone down immensely and has become cheap and mediocre. © 5808 Bihar GK. All rights reserved. XHTML / CSS Valid.